> Citation: James Earl Leverich Papers, State Historical Society of Wisconsin, La Crosse Area Research Center, Murphy Library, University of Wisconsin- La Crosse. The real title of this collection is the J. Earl Leverich Papers. Leverich was a prominent Wisconsin politician during the Great Depression, most well-known for his connection to Wisconsin’s “oleo wars.” He was one of the politicians who fought to ban oleo, a type of margarine, from being sold in Wisconsin. The collection contains 34 boxes; however, this finding aid looks at 2 folders in Box 1 of the collection. Folder 7 contains mostly newspaper clippings on the anti-oleomargarine movement. Folder 8 contains correspondence regarding oleo and the struggles the dairy industry was facing. After the stock market crashed in 1929, people understandably began to pinch pennies, and because oleomargarine was cheaper than butter, it began to threaten the dairy industry. In the words of the dairy farmers, the oleomargarine industry is “strangulating the life of our Dairy Industry.” In 1931, Wisconsin passed a law banning oleomargarine, but Dane County Circuit Court judge, Justice Zimmerman, found the law unconstitutional. This led to dairy farmers in Wisconsin gathering together to raise money to appeal the decision. They also asserted that the Dane County Circuit Court was biased against the dairy industry and should not be permitted to rule on future dairy-related cases. If you want to read this law, go to “See Also.” The name of the law is Chapter 96 of the Laws of 1931. 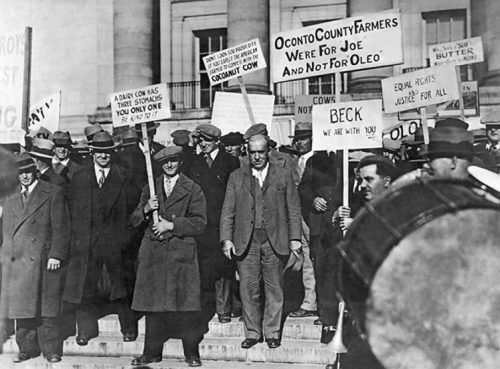 This finding aid focuses on the battle between Wisconsin’s farmers and the courts. It pieces together the letters and articles found in the folders to make the narrative easier to follow. It also notes some of the most important people involved in this situation. James Earl Leverich—Dairy farmer and key player in the anti-oleo movement. Most of the collection is letters to and from him, and many of the personal letters address him as Earl. He was the chairman of the Anti-Oleo Fund and Dairy War Chest, and the president of the Monroe County Co-Operative Creamery Association. He was elected as state senator in 1934, several years after the events of these folders took place. Joseph David Beck—Congressman from 1920 until 1929. Beck sponsored bills taxing oleomargarine, as well as tackling other issues in the dairy industry. In 1931, he was appointed commissioner of the Wisconsin Department of Agriculture and Markets. He was another big player in these events—other than Leverich himself, Beck is the person mentioned most often in these folders. In 1932, he was found in contempt of court (you’ll have to read the collection to learn all the details), but was so popular with Wisconsin dairy farmers that they all contributed to pay his $250 fine! Beck is really the “main character” of this narrative. Albert G. Zimmerman—the judge on an important court case in the oleo wars. Zimmerman was a judge in the ninth federal circuit court and claimed to have nothing against the dairy industry. Indeed, he later stated that he was just following the precedent of a previous case. Prior to becoming a federal judge, Zimmerman had been the business partner of “Fighting Bob” La Follette, a prominent Progressive politician! 1) While most of the contents of this collection are typewritten, there are some handwritten letters which can be difficult to read. You can do it! 2) Archivists try to keep the contents of each folder in chronological order, but it is easy for them to get messed up. You may find something dated from 1931 after something from 1933. 3) The contents of this collection frequently reference a court case, Jelke Co. v. Hill et al. Reading the records of this case will make this collection much easier to understand. You can find a link to this case in the “See Also” section. 4) This finding aid follows events chronologically. However, in order to do this, it bounces back and forth between Folders 7 and 8, which are both contained in Box 1. The folder number will always be in bold print, to make it easier to follow. Folder 7 contains an (undated) article from the Milwaukee Journal, titled “Beck Is Still Parading but Tune Has Changed.” The article interviews Beck about his thoughts on the influx of vegetable oils from the Philippines, and how that affects the dairy industry. Notice how people in the Philippines responded to this controversy! Folder 8 contains records of a November 17, 1931 meeting in Monroe County. It was attended by citizens concerned about the fate of the dairy industry. See if you find any names that show up other places in the collection. Folder 7 also contains an article titled “Farm Parade Against ‘Oleo’ Marshalls 400.” The article was written after the protest occurred, giving details of the parade. Take note, someone brought a goat! There is also an undated article in Folder 7, titled “Bank Deposit Bill Is Signed.” This new bill would tax oleomargarine at 6 cents a pound, and make it legal to publish lists of those who sold oleo. Why do you think it had been illegal to publish these lists? By the way, this bill is also mentioned in Folder 8, in a letter dated January 11, 1932. Folder 8 contains a January 10, 1932 letter from a man named Holmes. He writes to Leverich and encloses a copy of a resolution that creameries near him sent out. Read this to get a sense of how strongly people felt about this controversy. Folder 7 also contains an undated article about the Vernon County Guernsey Breeders Association’s plan to circulate a petition protesting Zimmerman’s decision. Notice how many different groups supported Beck. Folder 8 contains a letter dated June 7, 1932. Leverich and several other men sent this letter, accompanied by a check, to the court to pay for Beck’s fine. These funds had been provided by many different farmers and creameries, mostly in amounts of 5 or 10 dollars. That means that many Wisconsinites had donated to help Beck! This letter proves that the Anti-Oleo Fund had been doing a lot of fundraising. If you look through the collection, you’ll find many more examples of this. “Factors in Low Dairy Prices: Consumption of Butter Substitutes Bigger Factor than Stock Crash,” Iron River [Wisconsin] Pioneer, January 23, 1930.